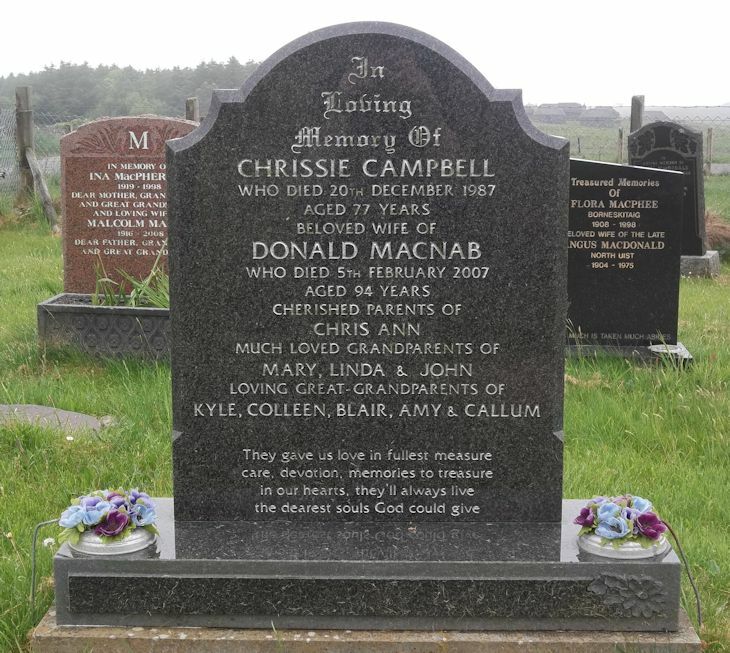 Skye Gravestones | Chrissie (Campbell) & Donald Macnab. Chrissie (Campbell) & Donald Macnab. In/loving/memory of/CHRISSIE CAMPBELL/who died 20th December 1987/aged 77 years/beloved wife of/DONALD MACNAB/who died 5th February 2007/aged 94 years/cherished parents of/CHRIS ANN/much loved grandparents of/MARY, LINDA & JOHN/and loving great-grandparents of/KYLE, COLLEEN, BLAIR, AMY & CALLUM. They gave us love in fullest measure/care, devotion, memories to treasure/in our hearts, they'll always live/the dearest souls God could give.